Brace yourselves for a gusher of leaks: The FBI report on Brett Kavanaugh could reach Congress today or tomorrow, with a final vote on his nomination this weekend. Majority Whip John Cornyn: "My hope is we'll see it soon perhaps as early as today." Why it matters: This report won't be made public, but expect Republicans to leak areas where the FBI didn't find evidence of an assault, and Democrats to leak areas where investigators found new dirt or desired more time. What we're watching: How Senators Susan Collins, Jeff Flake and Lisa Murkowski emerge after their turns reading the forthcoming FBI summary. Collins: “The president’s comments were just plain wrong." Flake: "I wish he hadn't of done it and I just say it's kind of appalling." "Whether you’re a Trump Republican, a Bush Republican, a McCain Republican, a libertarian or a vegetarian — you’re pissed. I’ve never seen the Republican Party so unified as I do right now." The bottom line: Not a single Republican has pre-emptively announced he or she will vote no. Be smart: This has been incredibly ugly, and even if it ends soon, don't expect the divisions it has exposed and exacerbated to go away. Why it matters: Only half of 30-year-old Americans in 2014 made more than their parents. Compare that to 1970, when 92% of 30-year-olds made more than their parents, according to a report by economist Raj Chetty. If young Millennials and Gen-Zers today end up making more than their parents, it would be the reversal of a falling trend, Axios' Stef Kight reports. Toys "R" Us may get a second life: This comes after calling off an auction for the retailer's brand name and other IP assets. Go deeper. Bernie Sanders introduced the ‘‘Too Big To Fail, Too Big To Exist Act’’ today. By its standards, companies like Wells Fargo, Goldman Sachs, J.P. Morgan, AIG and MetLife would need to shrink their assets or break up. Read the bill. Between the lines on Honda's massive investment in Cruise: The Japanese company is too small to develop autonomous vehicles on its own, while GM needs Honda's unique engineering talents. Go deeper. Scientists may have detected the first moon orbiting a planet outside our solar system, known as an "exomoon." Go deeper. 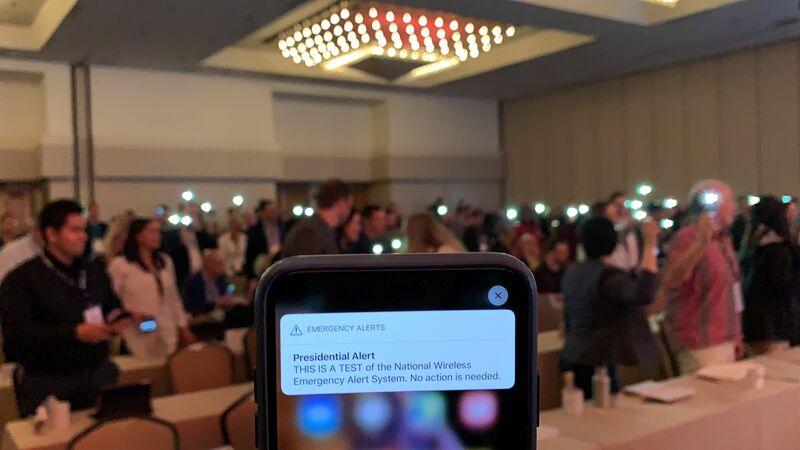 The presidential alert test at 2:18 p.m. EST went about as you'd expect today, featuring a mixture of jokes and people surprised by a "Presidential Alert." 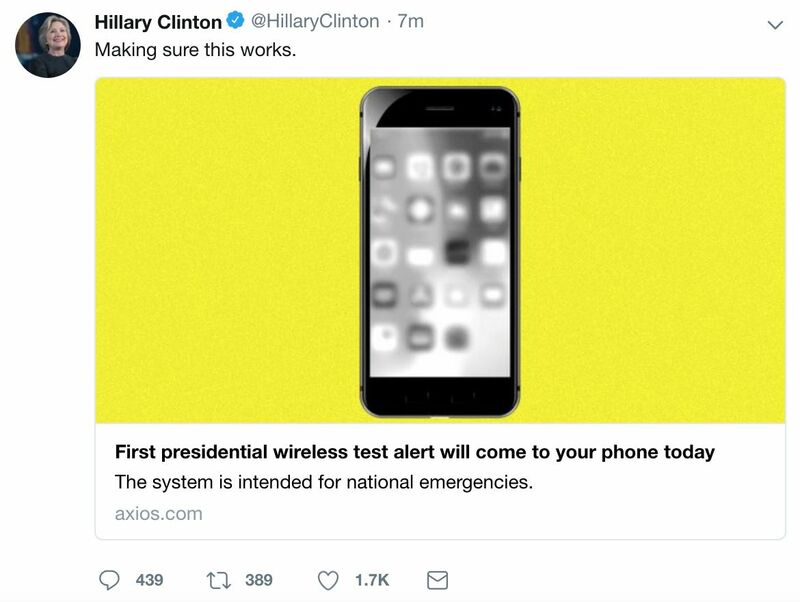 Even Hillary Clinton made sure to get in on the fun.